Does anyone have experience with PCB design? My balloon payload finalized, I'm now at around 20 grams or so. This is 5 grams heavier than I want for optimal altitude. I can lose unnecessary resistors, etc., but this might gain me at most 1 gram. My heaviest component by far is the Si5351A breakout board at 5.3 grams - https://www.etherkit.com/rf-modules/si5351a-breakout-board.html You'll notice that it's on a thick PCB, it has 3 outputs (I only need 1), and it has 5v to 3.3v conversion on-board (I'm strictly 3.3v). It should be 3.3v and one output only, with header and edge mount SMA pads. On a thin PCB, with 3.3v only and one output (header and edge-mount SMA pads), I think this could come in at 1 gram or less. I think this would be a very popular board that you could make some $$$ off of. Is there anyone here or do you know anyone that would be interested in this. I'd fund the prototype boards, but need someone smarter than me to do the design. I have the full PCB design files and schematic for 3 different 5v/3.3v boards that would get you most of the way there. D'oh. Hit Send a bit too early. Anyway... I could go from 9 to 4 (maybe 3 or 2) solar cells with a SPV1040 step-up converter / charge controller - http://www.st.com/en/power-management/spv1040.html - (or similar) to charge the super capacitor to 5 volts. It would take a bit longer to charge it, but it should maintain the charge long enough for the regular transmissions. This would also need a custom PCB (at least I can't find an existing charger breakout board that is in the 0-2 gram weight range). If I could pull off both of these adjustments, that should put my payload well below 15 grams which would be optimal for a higher altitude float. Is Brandon Tibbetts on this list? He's done some PCB design work before. I think I can figure out which components can go away on the Si5351A board and order a prototype, but this level of electronics is definitely not my specialty. As a quick update, I've been working with Jason from Etherkit and he's designing a breakout board for the clock generator - https://github.com/NT7S/Si5351APicoBoB/blob/master/pcb/Si5351APicoBoB.pdf It should be MUCH smaller and lighter than the existing board - I'm thinking at most 2 grams (if you don't add the headers and wire it directly). He's going to upload to OSH Park after he's designed the PCB and I'm going to order at least a few soon. Is anyone else interested in some? Gary? Now I'm considering designing a breakout for a small solar charge controller so I can use fewer panels. The idea is to charge the supercapacitor with the minimum number of solar cells possible while also ensuring that there's enough juice to get through the 2 minute transmissions. So how many components must you solder on this new board he will upload to oshpark? - The Si5351A. It's VERY small (only 3mm) and has 8 legs, so is likely to be a tricky solder. I've ordered a finer soldering iron tip! This photo gives a good sense of scale for the components - https://cdn-learn.adafruit.com/assets/assets/000/018/751/medium640/adafruit_products_solder1.jpg?1407866334 The TCXO and Si5351A are the two components between SCL and CLK1. You can see how with only these few components that the board could be very small and light. Jason should have the PCB design done soon. I think I'm also going to swap out my supercapacitors with this one - http://www.digikey.com/scripts/DkSearch/dksus.dll?Detail&itemSeq=231174428&uq=636335947477185122 It has lower capacitance (1.5F vs 2.5F), but saves a full gram of weight. I think with these changes I should be pretty close to my target of 16 grams. Yes I'd be interested in helping, but have been loaded with quite alot in general. I am experienced some in layout, and should be able to put something together if needed. Unless there is a quicker/easier route that is already in progress, i'd be happy to try though. Were you thinking of .030 thick pcb or .062? I've used express PCB to get things done in the past and typically just design the board to the size I need, and cut them out, getting multiples out of the fixed size sheets they offer. (PCB 3.8 x 2.5 x .062 thick) The software is all manual place and routing, but for simpler circuits not too bad. Is there a desired connector for J's, or just solder pads to hard wire into? There are a couple of newer layout design software packages I've been looking at trying out. Things are rapidly evolving in PCB EDA and multiple open source options. Maybe this would be a good time to try one.. Thank you for the offer. It sounds like this board is being designed, so that should be taken care of. To answer your questions though, I'd want anything on the thinnest PCB board readily available for weight savings, though Express PCB looks pretty slick. 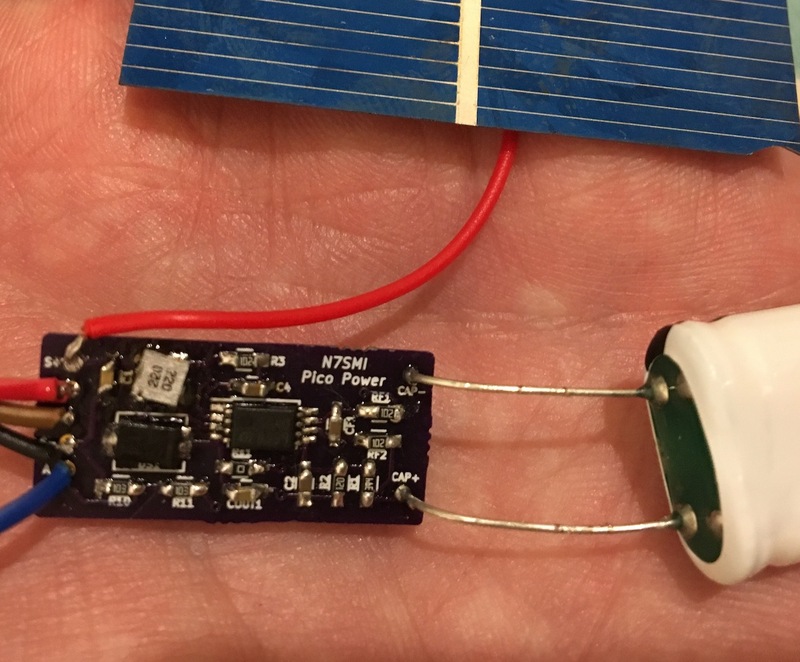 I'm going to try out this solar upconverter/charge controller - https://www.tindie.com/products/onehorse/bq25504-solar-cell-lipo-charger/ This should allow me to drop most of my solar cells to feed 1 volt or so to the upconverter which will charge the 5v supercapacitor to 4.2v. And it manages the system power and pulls the plug at 3.27 volts - so I won't drain the supercap overnight and won't get into a start/stop loop with the Arduino at sunrise/sunset. It also has a high/low pin to indicate low voltage, so I could detect this before starting a transmission. I'd be happy to hear any thoughts on whether you think this is a good idea or if there's anything I'm overlooking. I mostly need to ensure that there's enough juice between the smaller solar cells and the supercap to get through each transmission. I'm at 5.8 grams for my 9 solar cells, so going to 2 cells should save around 3.5 grams. The charge controller is only .7 grams (around .4 grams if I order the thinner board from OSH Park and assemble it myself), so that's a savings of around 3 grams. If my first flights work, I might try designing and fabricating my own custom payload boards - one tiny board to handle everything would be VERY small and MUCH easier to put together on a payload - and more reliable too without all of the wiring. This is what most of the very successful (global circumnavigation is a good measure) floating balloons go with. Some are as low as 6 grams (the weight of one US quarter) for the entire payload! Yep, that sounds like you're on the right track. I'll keep my eye open for thin PCB options, and once everything is proven out, then could help put it all to one thin/tiny PCB. As you mentioned that is key for longer term reliability. Simple GPS antenna work better horizontal, but not entirely deaf while vertical either..
Do you have a system/component overview? Or did I miss it somewhere. Also were you archiving the code somewhere? I'll put together a GitHub repository for the code and will share it soon. You won't really be able to test it without the hardware, but I'm happy to share it. The charge controller didn't work as expected. The idea was good (the board was only .6 grams), but I didn't realize that the IC has an input current limiter of 100mA. With the voltage upconvert (1.5v converted to 4.2v), this decreases current and didn't leave enough to keep things running. By the time I added enough solar cells to maintain adequate current, it no longer provided a weight saving to use the charge controller. I'm looking at different options - or just might go with a slightly smaller solar cell and run 8 or 9 of them. I've been testing everything and it seems to work great. I have it sitting out in the sun this morning to see what happens in marginal solar conditions as the sun comes up. The WSPR mode is incredibly efficient - it was heard in Florida on 10 milliwatts last night. The new, smaller clock generator should be here in a couple weeks, then I think I'll have most everything necessary for a launch. 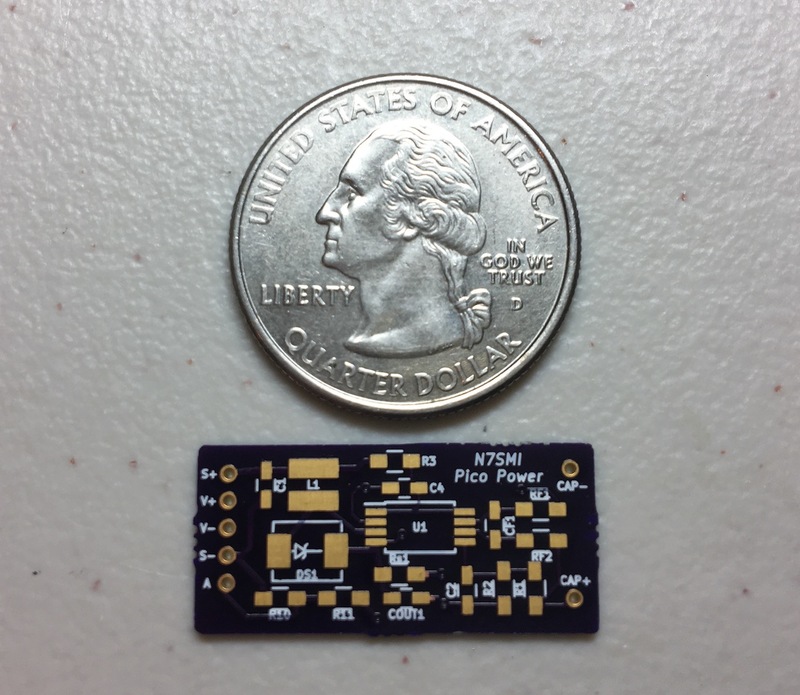 The board is very small - only 1 inch X .5 inches. The components are mostly tiny 0603 size - so should be a fun challenge to solder. The IC is 3mmX4.4mm. The S+/- pads are for the small solar cells. I should be able to use 2 of them in series to make ~1.2 volts. The circuit then upconverts this to 5 volts which charges the supercapacitor (CAP+/-) which functions as a battery (except this one works at -40 degrees). It then routes back to V+/- which will go to the Arduino raw power input. Most of the capacitors and resistors are used to set the controller charge values. There's also a voltage divider on the output that goes to the A connector. This will allow me to measure the output voltage from the Arduino so I don't transmit or turn on the GPS if the voltage is too low. Feedback or criticism of the design is VERY welcome. I figure I have around 50/50 odds that I designed this in a way that will actually work. I'll order up some PCBs from OSH Park soon and give it a go. 0603 components aren't that bad to solder. It's when you get down to 0402 size that they get to be a pain. I have a temp controlled soldering station that includes the heat gun for SMD work/rework, and various tip sizes. I also have some awesome indium solder. You are welcome to use it. There are some great SMD solder videos on Utube. Some use solder paste across the pads, hold the component with tweezers and heat it up with the heat gun and push in place. Subject: Re: [BARC-HAB] PCB designer? Weight issues. My charge controller boards have arrived and they actually work - despite my soldering skills! Photos are attached. I'll probably design a second version with a few minor modifications - mostly a smaller Schottky diode, bigger pads for that pesky Inductor (the L1 silver component near the top left), and better labelling. This charges the supercapacitor to 5.2 volts from only a couple small .5v solar cells. I now need to determine how many solar cells I need to provide sufficient current for the 2 minute transmission. My current draw is 3-5mA when idle, 35mA during GPS acquisition, and 42 mA when transmitting. I hacked around the issue of the transmitter interfering with the GPS. I added an NPN transistor to act as a switch to use the Arduino to turn the power on to the transmitter only when it's needed. Unfortunately, when I turned it on, the interference kicked the GPS out of sleep mode (jumping it from 5mA to 30mA, or 70+mA for everything). So I added a second switch to turn the GPS off when it's not needed. This adds a bit of weight and requires a longer cold boot GPS fix every 10 minutes, but that shouldn't be an issue at 40,000 feet. If I can get the antenna set up and everything tied together, I might see if the USU folks will let me fly one on one of their balloons this Saturday. If you can't hitch a ride on a is balloon, I'm still willing to take you up on the hexacopter. I have a telemetry down link now, so I can see what the status is. Including altitude. It would just have to wait until I get back in town, which looks like it will be the 31st. Are you sure you wish to delete this message from the message archives of BARC-HAB@groups.io? This cannot be undone.